Officers with the Lewiston (NY) Police Department said goodbye to K-9 "Taser" following a battle with cancer. "It is with a heavy heart that we announce the passing of Taser after he battled cancer the last few months," the department said on Facebook. Image courtesy of Lewiston PD / Facebook. Officers with the Lewiston (NY) Police Department said goodbye to K-9 "Taser" following a battle with cancer. "It is with a heavy heart that we announce the passing of Taser after he battled cancer the last few months," the department said on Facebook. 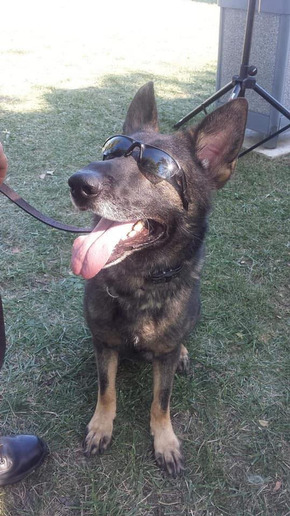 "Taser was a huge part of our department and will be missed by all of us. He was trained in tracking, handler protection, and drug detection and was successful on many occasions during the course of his career. Taser you were a great friend and co-worker and will be missed by all of us."